In Christ we are one new man (Col. 3:10-11). 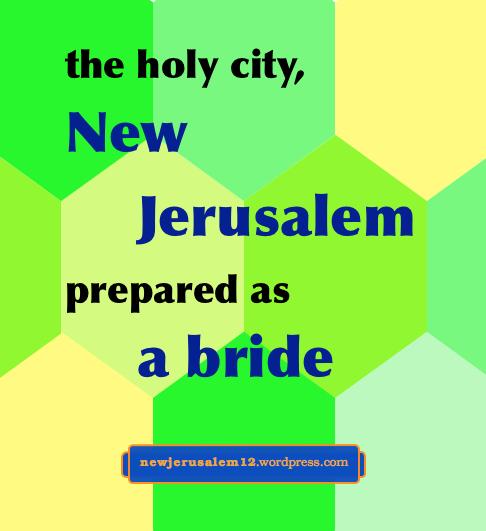 New Jerusalem is the bride, the wife of the Lamb, Jesus Christ. This is a very important statement in Revelation 21. It declares that New Jerusalem is not a physical city but a corporate living person! Revelation is a book of spiritual signs. 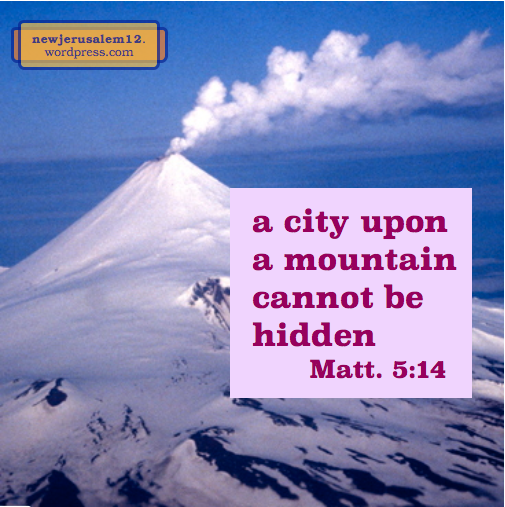 New Jerusalem described as a city shows that it is God’s kingdom built up. New Jerusalem as a bride shows it is a corporate person as the consummation of the church as the Body of Christ, the one new man, and the wife (all three of which are presented in Ephesians). In Ephesians 5 the church is described in the human context of husband and wife. This church will be the glorious bride, New Jerusalem, which Christ will present to Himself. New Creation: Now or Later? One aspect of this new creation is revealed much earlier, in 2 Corinthians 5:17, “If anyone is in Christ, he is a new creation.” And concerning our Christian life, Galatians 6:15 tells us, “a new creation is what matters.” This is inward, spiritual, a forerunner of the full new creation revealed at the end of Revelation. Today we experience the inward new creation when we live in Spirit. When we reach Revelation 21, the entire creation, inwardly and around us, will be new with the full reality of New Jerusalem. * Part of footnote 1 on Gal. 6:15 in the Recovery Version NT; footnotes written by Witness Lee. 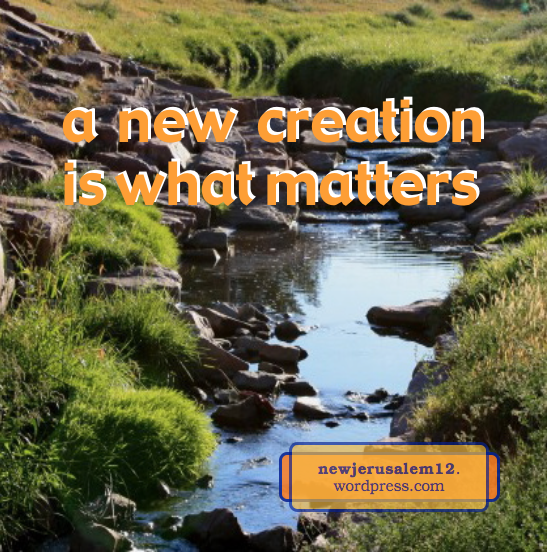 New Jerusalem: Now or Later? In Revelation 21:2 John declares, “I saw the holy city, New Jerusalem, coming down out of heaven from God, prepared as a bride adorned for her husband.” Two thousand years ago John saw New Jerusalem. This is God’s word. In God’s eternal view, outside our temporal limitations, New Jerusalem exists, and in spirit the angel showed the city to John. In our time-limited view, New Jerusalem is in the future. Yet, God works in us through time to bring forth the city. Today all believers are members of the Body of Christ (Rom. 12:5). This is our position. 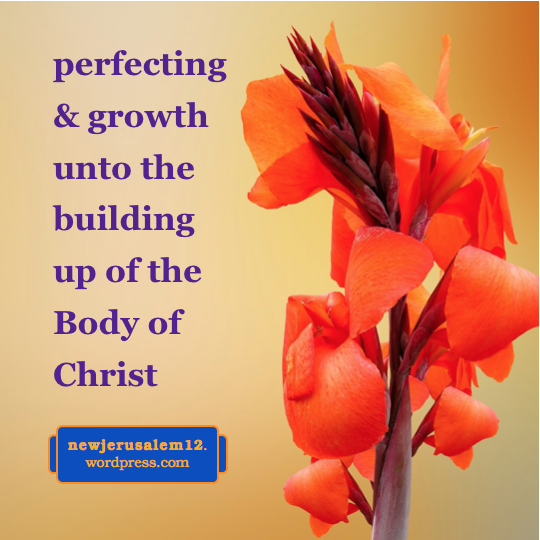 Now we need perfecting in our condition and function that we may grow into Christ for the building of the Body until we are full grown to match New Jerusalem. This is Ephesians 4:11-16. Today we are also constituents of the new man created by Christ on the cross. This is another aspect of our position. Now we need the Spirit’s renewing (Eph. 4:23) to have a proper living in the new man. By the Spirit’s work in us, the new man is “being renewed unto full knowledge according to the image of Him who created him…where Christ is all and in all” (Col. 3:10-11). When Christ is everything in our living then the new man will fully express Him. Reaching this goal will bring us to New Jerusalem. Yes, John saw the city, but in our present human situation we still need the Lord’s mercy to respond to Him for our growth into Him. The gospel brings us to God’s redemption that we may receive His eternal life and partake of His salvation throughout our Christian life. This is our path to New Jerusalem. 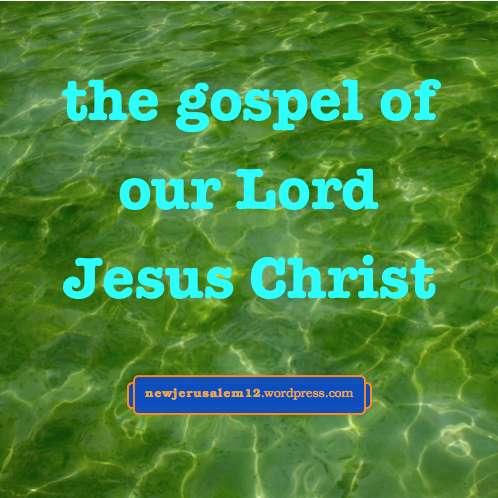 “The gospel of Jesus,” “the gospel of Jesus Christ,” and “the gospel of Christ” are mentioned in about 30 New Testament verses. Jesus Christ is the center of the gospel and He will be the center of New Jerusalem. He is the same yesterday, today, and eternally (Heb. 13:8). On the cross Christ created one new man, composed of all the people He redeemed and reconciled to God, thus making peace (Eph. 2:14-16). In this one new man, the stepping stone to New Jerusalem, He is all and in all, and in Him our racial, social, cultural, and national distinctions have been eliminated (Col. 3:11). Now our need is to “be renewed in the spirit of our mind” (Eph. 4:23). 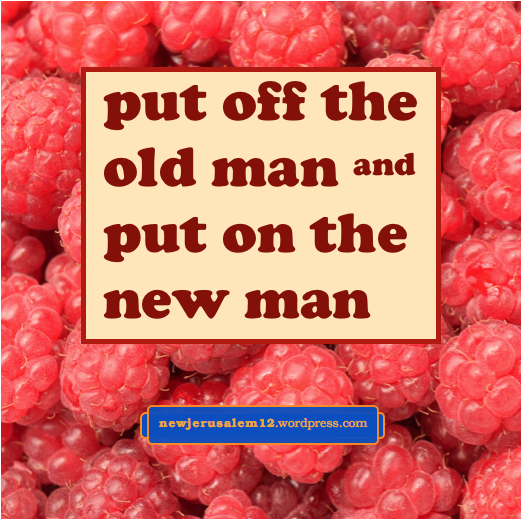 By this renewing, which is day by day, not once for all, we practically put off the old man—our old ways of thinking and living—and put on the new man so that Christ is expressed. This renewing prepares us for New Jerusalem which is fully new in Christ and fully expresses Him. This is the goal of the gospel and the goal of Christ’s human living, death, resurrection, and ascension. * Part of footnote 1 on Matt. 1:1 in the Recovery Version NT, footnotes written by Witness Lee. We follow the Lord Jesus on the path to New Jerusalem by applying His death as we deny ourself, so that all our natural life is terminated. This opens the door for the divine life, the eternal life, the life we received in regeneration, the life of New Jerusalem, to spread in us and to be magnified in our living (Phil. 1:20-21). Galatians 2:20 also shows this putting off and putting on: “I am crucified with Christ; and it is no longer I who live, but it is Christ who lives in me; and the life which I now live in the flesh I live in faith…” This living one with Christ in me is the life of the new man and of New Jerusalem. “It is no longer I who live” is because “I am crucified with Christ” and by the Spirit I am applying this every day. This is putting off the old living. This is to deny self and bear the cross daily. “Christ lives in me” to impart the resurrection power for this denying. “I now live in faith.” This is putting on the new man who ultimately becomes New Jerusalem. Through the cross our natural life, our fallen life, our soul life, is put away. This opens the door for the increase and spread of Christ, our new life, our resurrection life, in us. This life, not our old life, is the life of New Jerusalem. 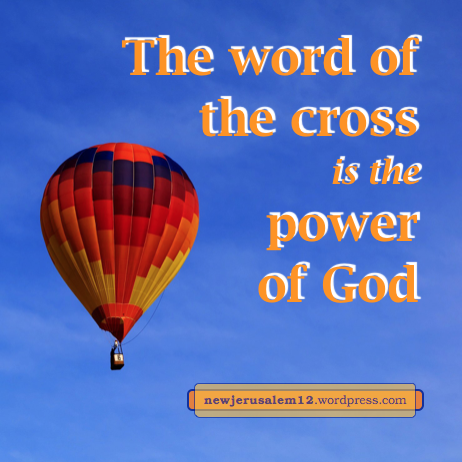 First Corinthians 1 speaks about the cross, which delivers us from our old life.. Verse 18: “The word of the cross is to those who are perishing foolishness, but to us who are being saved it is the power of God. If we think speaking about the cross is foolishness, then we are in the wrong realm. Verses 23-24: “We preach Christ crucified, to Jews a stumbling block, and to Gentiles foolishness, but to those who are called…Christ the power of God and the wisdom of God. Christ crucified, to release the resurrection life, is God’s wisdom and God’s way. Now the cross is being applied within us, making us new and living for New Jerusalem. 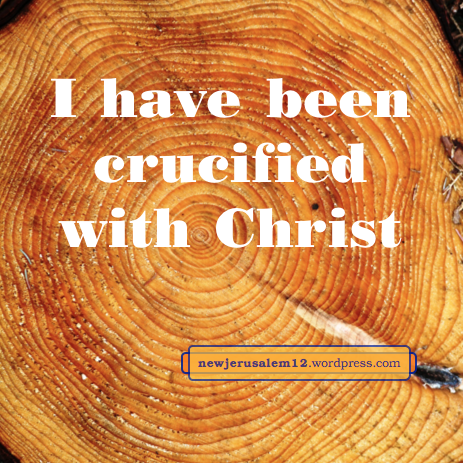 Because of this wonderful result, Paul boasted in the cross of our Lord Jesus Christ (Gal. 6:14). Remember that the purpose of the cross is not suffering; the purpose is to kill the old man so hat the new man can come forth in reality for New Jerusalem. 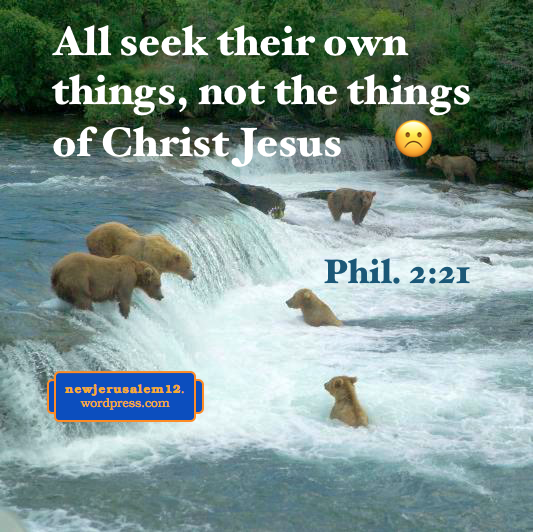 The Lord Jesus, as a man on earth, did not seek His own will nor His own glory. He is a pattern to us and asks us to follow Him, denying ourself and not loving our soul life. so that His eternal life can spread in us to prepare us for New Jerusalem. Besides self-will and self glory, other aspects of self to be denied are opinions, preferences, complaints, vain talking, and the ways I like to do things. Perhaps none of these are evil, but they are self. The Lord tells us to deny our self, good or bad, to follow Him and be worthy of Him. Our self is our old man, the man of God’s creation who was corrupted by Satan. The denying of the self is the putting off of the old man, which is necessary to put on the new man of God’s new creation, the forerunner of New Jerusalem. Although the Lord had a physical cross, He also bore the cross internally throughout His ministry. We also bear an internal cross, “by the Spirit putting to death.” The life released through the cross brings us to New Jerusalem. 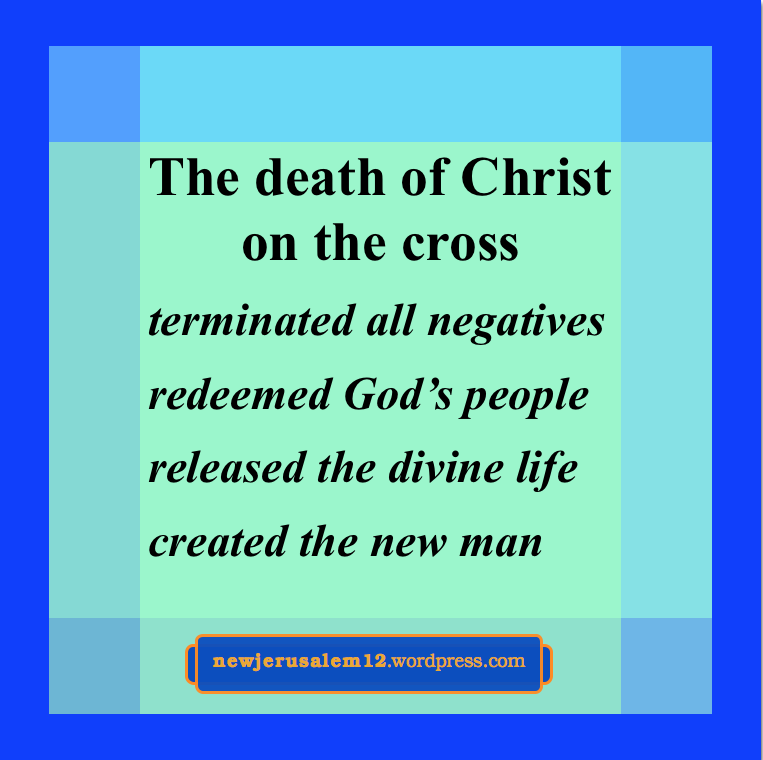 The death of Christ terminated, redeemed, released, and created to bring all of God’s people onto the path to New Jerusalem. The effectiveness of Christ’s death is eternal. Hebrews 9:14 says, “How much more will the blood of Christ, who through the eternal Spirit offered Himself without blemish to God, purify our conscience from dead works to serve the living God?” The eternal Spirit makes His death eternally effective and applicable to us at every time. And His death purifies us to serve the living God, which service will continue in New Jerusalem (Rev. 22:3). 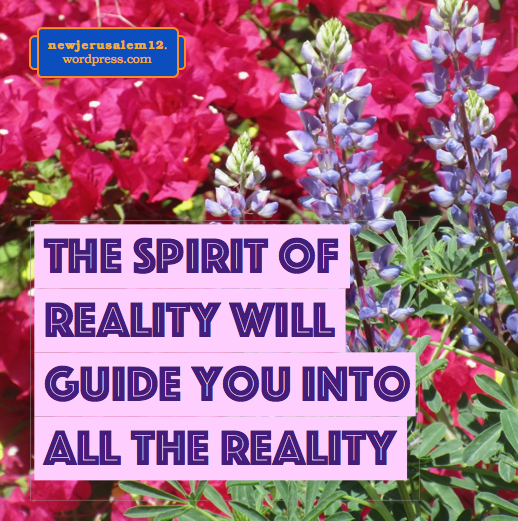 The Lord promised us “when He, the Spirit of reality, comes, He will guide you into all the reality” (John 16:13). In resurrection this Spirit came and is guiding us into the reality of all that Christ accomplished on the cross in order to bring us unto New Jerusalem. Through the Spirit all that Christ accomplished is available to us. Through the eternal Spirit His redemption with the forgiveness of sins is applied to our conscience, so that our conscience can be free of condemnation. Through the Spirit the released divine life comes into us to regenerate us. “That which is born of the Spirit is spirit” (John 3:6). And the Spirit of reality makes the new man real to us. The Spirit is the reality of our path to New Jerusalem. * Links to many posts on this are in Jesus Opened the Pearl Gates, Let’s Enter! The death of Christ on the cross had a terminating aspect which consummates in the lake of fire. It also has redeeming, releasing, and creating aspects which consummate in New Jerusalem. All of these steps are for our path to New Jerusalem. The first aspect ended our flesh, our old man, and our sinful nature. It also terminated the world and the ruler of the world. The second aspect bought us for God and includes the forgiveness of our sins. The third aspect released the divine life which has now been imparted into us to regenerate, renew, transform, and glorify us. The fourth aspect brought us into God’s corporate new man in the new creation. All of this is necessary for New Jerusalem. Praise the Lord for His accomplishments. Our participation in the death and resurrection of Christ have nothing to do with our birth date nor with what kind of person we are naturally. It was accomplished by God who is outside of the limits of time. And He accomplished it for His eternal purpose, to bring us to His goal, New Jerusalem. The Lord Jesus told His disciples, “You are the light of the world.” (Matt. 5:14). “You” (plural) are “the light” (singular). All of us, as His disciples, are a corporate light to the world. Eventually Jesus Christ, the Lamb, shines within New Jerusalem to be light to the universe. Jesus continued, saying, “It is impossible for a city situated upon a mountain to be hidden.” We, the corporate light, with Him shining within and through us, are the unhidden city. Ultimately we are New Jerusalem, His expression to the universe. All who have believed into Jesus Christ are today His body (Rom. 12:5). We are all the one new man (Eph. 2:15. We are all God’s spiritual house (1 Peter 2:5). We are all the city of Matthew 5. And we will all be the eternal city, New Jerusalem. Matthew 5:14 is a foretaste of New Jerusalem. The body, new man, house, and city are God’s eternal purpose—a living, corporate expression of Himself in a corporate humanity filled with Himself. In position, we are in this corporate entity, but we need care to keep our living according to it. The Lord told us, “let your light shine before men,” not hiding it under a bushel (Matt. 5:15-16). A bushel is for measuring grain, food. We should not hide our light by being overly occupied with our jobs, anxious to earn a living to take care of our eating (Matt. 6:25, 31). Since we are “light in the Lord,” Ephesians 5 charges us to “walk as children of light.” In position we are light but we need to walk in the Lord, loving Him, musing on His word, and opening ourselves to Him in prayer. The shining that results from walking in light is a precursor of New Jerusalem as the unhidden city on a mountain. Photo by Allan Shimada, courtesy of U.S. National Oceanic and Atmospheric Administration. New Jerusalem, a city of divine life, is mature in this life. We have received this life and are growing in it so that we match New Jerusalem. Our growing involves our perfecting, similar to proper human growth requiring many years of education. Here we continue looking at verses about our growth and perfection. 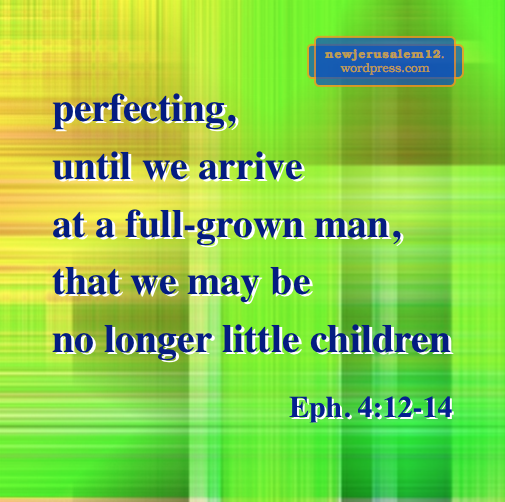 These verses speak about growing from little children to a full-grown man. This growth is a normal part of our Christian life. New Jerusalem will not be full of spiritual children but is composed of full-grown believers. This growth also takes us from children (plural) to a full-grown man (singular). This is the building together of the Body of Christ as the precursor of New Jerusalem. In ourselves we are individuals, but in Christ we become the one new man. This is part of our Christian perfecting. These verses also speak about our being perfected for our participation in the work of the ministry which causes the building up of the Body of Christ. We all have a share in the building up of His Body, which is the building up of New Jerusalem. Lord, cause me to be perfected for this!